Earl is a boy who does all of these really cool things. The young boy admires Earl but eventually realizes that they are both cool and Earl is just a regular guy. 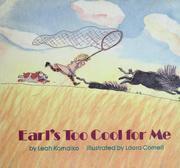 Komaiko, Leah, “Earl's too cool for me,” Children's Picture Book Database at Miami University, accessed April 21, 2019, https://dlp.lib.miamioh.edu/picturebook/items/show/8755.